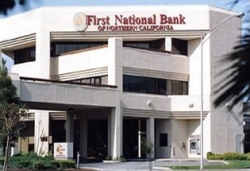 SOUTH SAN FRANCISCO, CA–(Marketwired – Apr 29, 2013) – FNB Bancorp (OTCQB: FNBG), parent company of First National Bank of Northern California (the “Bank”), today announced net earnings available to common shareholders for the first quarter of 2013 of $772,000 or $0.20 per diluted share, compared to net earnings available to common shareholders of $1,102,000 or $0.30 per diluted share for the first quarter of 2012. Dividend payments on the preferred shares outstanding were made as required by the Treasury Department’s Small Business Lending Program. Total assets as of March 31, 2013 were $897,478,000 compared to $746,649,000 as of March 31, 2012. Our net loans increased by $98,976,000 or 22.1% year over year. Our deposits increased by $138,734,000 or 21.3% during the same period. At March 31, 2013, the Company had considerable liquid assets on hand as evidenced by $246,460,000 in available for sale securities and $39,092,000 in cash and cash equivalents. “During the first quarter of 2013, the Board of Directors approved the closure of our island of Guam office. This office was acquired by the Company in our acquisition of Oceanic Bank that was completed in September 2012. Alternatives to closure, such as a sale to another financial institution, either in whole or in part, were explored. After a considerable due diligence period, the Company was not able to find a suitable buyer and a tentative closure date of June 14, 2013 was established. In connection with the closure of our office on the island of Guam, during the month of March 2013, an accrued ‘Stay Bonus’ for all the employees of the Guam office was established totaling $78,000. Additionally, an occupancy accrual for the cost of the Guam branch lease through December 31, 2013, the end of the lease term, of $176,000 was also recorded. Together, the cost of employee severance and the cost to accelerate the expense of the Guam lease was $254,000 and this expense is reflected in our 1(st) quarter, 2013 operating expenses. The Company intends to retain the loan relationships as well as the Certificate of Deposit customers through their maturity date, and will service those customers from our San Francisco locations, but the checking and savings deposit account holders will not be retained. Overall, the closure of the Guam branch will allow the Company to concentrate our efforts on our operations in San Francisco and on the peninsula,” stated Tom McGraw, Chief Executive Officer. “Our loan portfolio, investment portfolio and deposit portfolio all experienced growth during the first quarter of 2013. Overall, our assets and our deposits grew by 3% during the quarter. Our stockholders’ equity increased during the first quarter as well. As we continue to integrate the Oceanic Bank purchase into the operations of the Company, we should begin to realize additional operational efficiencies. Controlling expenses is a management priority in the near term. Our tax equivalent net interest margin decreased by 3 basis points during the first quarter of 2013 compared to the fourth quarter of 2012. The low interest rate environment currently supported by the Federal Open Market Committee of the Federal Reserve Bank has made it difficult for community banks to maintain net interest margin. In order to offset declines experienced in the yield of our earning assets, management has reduced the interest rates we pay our deposit customers. Further declines in our net interest margin in the near term are likely. We are doing everything that we can to effectively manage our balance sheet in this low interest rate environment,” continued Mr. McGraw. “The quality of our loan portfolio continued to improve during the first quarter of 2013. Our total loans past due have declined since December 31, 2012 while at the same time we have increased our allowance for loan losses. Our allowance for loan losses coupled with our non-accreteable discount on purchased impaired loans was 1.7% of our outstanding loans as of March 31, 2013. We continue efforts to work with our borrowers that have experienced difficulty in making their loan payments towards the goal of finding solutions that are mutually beneficial to both our customers and the Company. We want the communities in which we live and do business to grow and prosper, and we take pride in doing our very best to help make that possible,” stated Mr. McGraw. Cautionary Statement: This release contains certain forward-looking statements that are subject to risks and uncertainties that could cause actual results to differ materially from those stated herein. Management’s assumptions and projections are based on their anticipation of future events and actual performance may differ materially from those projected. Risks and uncertainties which could impact future financial performance include, among others, (a) competitive pressures in the banking industry; (b) changes in the interest rate environment; (c) general economic conditions, either nationally or regionally or locally, including fluctuations in real estate values; (d) changes in the regulatory environment; (e) changes in business conditions or the securities markets and inflation; (f) possible shortages of gas and electricity at utility companies operating in the State of California, and (g) the effects of terrorism, including the events of September 11, 2001, and thereafter, and the conduct of war on terrorism by the United States and its allies. Therefore, the information set forth herein, together with other information contained in the periodic reports filed by FNB Bancorp with the Securities and Exchange Commission, should be carefully considered when evaluating its business prospects. FNB Bancorp undertakes no obligation to update any forward-looking statements contained in this release.